The Stroke Blog: A milestone, a survey, and a giveaway. A milestone, a survey, and a giveaway. 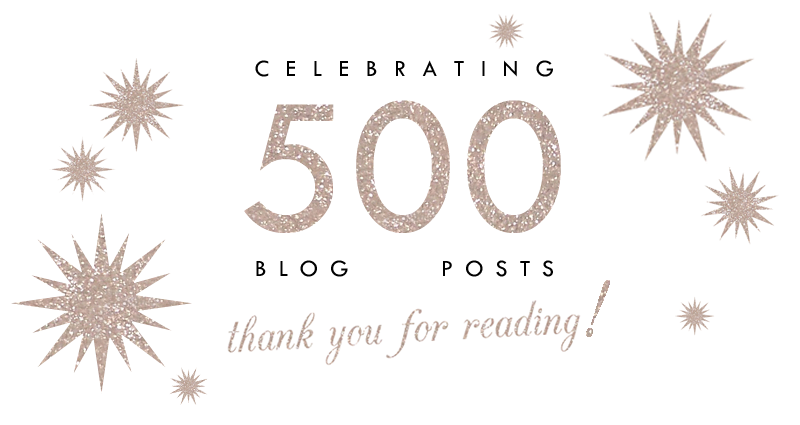 This is my five hundredth blog post! Over three years and five hundred posts this blog has changed. So have I. Two more degrees, a stint on reality TV, a new tattoo (surprise! I got it earlier this year and never told anyone), new friends, new readers, a wedding. Whew. Through all of that change this space has remained one that I truly love writing and connecting in. Like Jenni said on her blog this week, it feels strangely like an appendage. But in a great way. This blog has allowed me to gently, timidly, embrace the writer I always was but pretended I wasn't. And to meet some wonderful people, both on and offline. In this, my five hundredth post, I'm initiating my first ever reader survey with the intention of using the results to grow as a blogger and a writer, and to make this space more engaging for you and I.
I would be so grateful if you would participate, it will only take 2-5 minutes to complete. Finally, to thank you for sticking with me over five hundred posts (and for participating in the reader survey) I want to send you a little love from Malta! One lucky reader will receive a little care package in the mail containing my favourite chocolate from Modica, melt in your mouth nougat from Malta, and a few other treats from the Mediterranean. Enter below (no strings attached) and, as ever, thank you for reading! Contest closes Tuesday, November 12th at 12:00 AM GMT+1 time. Winner will be selected randomly and announced on Wednesday, November 13th here and across my social media channels. Limit one entry per person. Open to international readers. Thanks for letting me know Anda! I've fixed the problem. No apologies required! There are many blogs I read that I don't comment on either ;) I don't expect every reader to. Thank you so much for participating in the survey! How's your magazine subscription going? Hmm...Rafflecopter still seems to be down - just an FYI! Thanks for letting me know Allie. Are you reading from an RSS feed? If so, you might need to open in a browser. If not, let me know and I'll try to figure it out. Thanks! Congrats on 500 posts, that's a big milesone! What do you eat when you're hungover? The results are in! Did you win?